The Arabic script has numerous diacritics, including i'jam ⟨إِعْجَام⟩ - i‘jām, consonant pointing and tashkil ⟨تَشْكِيل⟩ - tashkīl, supplementary diacritics. The latter include the ḥarakāt ⟨حَرَكَات⟩ vowel marks - singular: ḥarakah ⟨حَرَكَة⟩. The Arabic script is an impure abjad, where short consonants and long vowels are represented by letters but short vowels and consonant length are not generally indicated in writing. Tashkīl is optional to represent missing vowels and consonant length. Modern Arabic is always written with the i‘jām - consonant pointing, but only religious texts, children's books and works for learners are written with the full tashkīl - vowel guides and consonant length. The literal meaning of tashkīl is 'forming'. As the normal Arabic text does not provide enough information about the correct pronunciation, the main purpose of tashkīl (and ḥarakāt) is to provide a phonetic guide or a phonetic aid; i.e. show the correct pronunciation. It serves the same purpose as furigana (also called "ruby") in Japanese or pinyin or zhuyin in Mandarin Chinese for children who are learning to read or foreign learners. The bulk of Arabic script is written without ḥarakāt (or short vowels). However, they are commonly used in texts that demand strict adherence to exact wording. This is true, primarily, of the Qur'an ⟨الْقُرْآن⟩ (al-Qur’ān) and poetry. It is also quite common to add ḥarakāt to hadiths ⟨الْحَدِيث⟩ (al-ḥadīth; plural: aḥādīth) and the Bible. Another use is in children's literature. Moreover, ḥarakāt are used in ordinary texts in individual words when an ambiguity of pronunciation cannot easily be resolved from context alone. Arabic dictionaries with vowel marks provide information about the correct pronunciation to both native and foreign Arabic speakers. In art and calligraphy, ḥarakāt might be used simply because their writing is considered aesthetically pleasing. Some Arabic textbooks for foreigners now use ḥarakāt as a phonetic guide to make learning reading Arabic easier. The other method used in textbooks is phonetic romanisation of unvocalised texts. Fully vocalised Arabic texts (i.e. Arabic texts with ḥarakāt/diacritics) are sought after by learners of Arabic. Some online bilingual dictionaries also provide ḥarakāt as a phonetic guide similarly to English dictionaries providing transcription. The ḥarakāt, which literally means 'motions', are the short vowel marks. There is some ambiguity as to which tashkīl are also ḥarakāt; the tanwīn, for example, are markers for both vowels and consonants. "Fatha" redirects here. For the jazz pianist, see Earl Hines. The fatḥah ⟨فَتْحَة⟩ is a small diagonal line placed above a letter, and represents a short /a/ (like the initial sound in English word "up"). The word fatḥah itself (فَتْحَة) means opening and refers to the opening of the mouth when producing an /a/. For example, with dāl (henceforth, the base consonant in the following examples): ⟨دَ⟩ /da/. A similar diagonal line below a letter is called a kasrah ⟨كَسْرَة⟩ and designates a short /i/ (as in "Tim") and its allophones [i, ɪ, e, e̞, ɛ]. For example: ⟨دِ⟩ /di/. When a kasrah is placed before a plain letter ⟨ﻱ⟩ (yā’), it represents a long /iː/ (as in the English word "steed"). For example: ⟨دِي⟩ /diː/. The kasrah is usually not written in such cases, but if yā’ is pronounced as a diphthong /aj/, fatḥah should be written on the preceding consonant to avoid mispronunciation. The word kasrah means 'breaking'. The ḍammah ⟨ضَمَّة⟩ is a small curl-like diacritic placed above a letter to represent a short /u/ (as in "put") and its allophones [u, ʊ, o, o̞, ɔ]. For example: ⟨دُ⟩ /du/. When a ḍammah is placed before a plain letter ⟨و⟩ (wāw), it represents a long /uː/ (like the 'oo' sound in the English word "swoop"). For example: ⟨دُو⟩ /duː/. The ḍammah is usually not written in such cases, but if wāw is pronounced as a diphthong /aw/, fatḥah should be written on the preceding consonant to avoid mispronunciation. The superscript (or dagger) alif ⟨أَلِف خَنْجَرِيَّة⟩ (alif khanjarīyah), is written as short vertical stroke on top of a consonant. It indicates a long /aː/ sound for which alif is normally not written. For example: ⟨هَٰذَا⟩ (hādhā) or ⟨رَحْمَٰن⟩ (raḥmān). The dagger alif occurs in only a few words, but they include some common ones; it is seldom written, however, even in fully vocalised texts. Most keyboards do not have dagger alif. The word Allah ⟨الله⟩ (Allāh) is usually produced automatically by entering alif lām lām hāʾ. The word consists of alif + ligature of doubled lām with a shaddah and a dagger alif above lām. Not to be confused with Maddah (religious singer) or Maddahi. The maddah ⟨مَدَّة⟩ is a tilde-shaped diacritic, which can appear mostly on top of an alif and indicates a glottal stop /ʔ/ followed by a long /aː/. In theory, the same sequence /ʔaː/ could also be represented by two alifs, as in *⟨أَا⟩, where a hamza above the first alif represents the /ʔ/ while the second alif represents the /aː/. However, consecutive alifs are never used in the Arabic orthography. Instead, this sequence must always be written as a single alif with a maddah above it, the combination known as an alif maddah. For example: ⟨قُرْآن⟩ /qurˈʔaːn/. The waṣlah ⟨وَصْلَة⟩, alif waṣlah ⟨أَلِف وَصْلَة⟩ or hamzat waṣl ⟨هَمْزَة وَصْل⟩ looks like a small letter ṣād on top of an alif ⟨ٱ⟩ (also indicated by an alif ⟨ا⟩ without a hamzah). It means that the alif is not pronounced when its word begins a sentence. For example: ⟨بِٱسْمِ⟩ (bismi), but ⟨ٱمْشُوا۟⟩ (imshū not mshū). This is because no Arab word can start with a vowel-less consonant (unlike the English school, or skateboard). But when it happens, an alif is added to obtain a vowel or a vowelled consonant at the beginning of one's speech. In English that would result in iskool, or iskateboard. It occurs only in the beginning of words, but it can occur after prepositions and the definite article. It is commonly found in imperative verbs, the perfective aspect of verb stems VII to X and their verbal nouns (maṣdar). The alif of the definite article is considered a waṣlah. To replace the elided hamza whose alif-seat has assimilated to the previous vowel. For example: فِي ٱلْيَمَن or في اليمن (fi l-Yaman) ‘in Yemen’. In hamza-initial imperative forms following a vowel, especially following the conjunction ⟨و⟩ (wa-) ‘and’. For example: َقُمْ وَٱشْرَبِ ٱلْمَاءَ (qum wa-shrab-i l-mā’) ‘rise and then drink the water’. The sukūn ⟨سُكُون⟩ is a circle-shaped diacritic placed above a letter. It indicates that the consonant to which it is attached is not followed by a vowel. It is a necessary symbol for writing consonant-vowel-consonant syllables, which are very common in Arabic. For example: ⟨دَدْ⟩ (dad). The sukūn may also be used to help represent a diphthong. A fatḥah followed by the letter ⟨ﻱ⟩ (yā’) with a sukūn over it (ـَيْ‎) indicates the diphthong ay (IPA /aj/). A fatḥah, followed by the letter ⟨ﻭ⟩ (wāw) with a sukūn, (ـَوْ‎) indicates /aw/. The sukūn may have also an alternative form of the small high dotless head of khāʾ (U+06E1 ۡ ), particularly in some Qurans. Other shapes may exist as well (for example, like a small comma above ⟨ʼ⟩ or like a circumflex ⟨ˆ⟩ in nastaʿlīq). The three vowel diacritics may be doubled at the end of a word to indicate that the vowel is followed by the consonant n. They may or may not be considered ḥarakāt and are known as tanwīn ⟨تَنْوِين⟩, or nunation. The signs indicate, from right to left, -un, -in, -an. These endings are used as non-pausal grammatical indefinite case endings in Literary Arabic or classical Arabic (triptotes only). In a vocalised text, they may be written even if they are not pronounced (see pausa). See i‘rāb for more details. In many spoken Arabic dialects, the endings are absent. Many Arabic textbooks introduce standard Arabic without these endings. The grammatical endings may not be written in some vocalized Arabic texts, as knowledge of i‘rāb varies from country to country, and there is a trend towards simplifying Arabic grammar. The shadda or shaddah ⟨شَدَّة⟩ (shaddah), or tashdid ⟨تَشْدِيد⟩ (tashdīd), is a diacritic shaped like a small written Latin "w". It is used to indicate gemination (consonant doubling or extra length), which is phonemic in Arabic. It is written above the consonant which is to be doubled. It is the only ḥarakah that is sometimes used in ordinary spelling to avoid ambiguity. For example: ⟨دّ⟩ /dd/; madrasah ⟨مَدْرَسَة⟩ ('school') vs. mudarrisah ⟨مُدَرِّسَة⟩ ('teacher', female). 7th-century kufic script without either ḥarakāt or i‘jām. The i‘jām ⟨إِعْجَام⟩ are the diacritic points that distinguish various consonants that have the same form (rasm), such as ⟨ـبـ⟩ /b/, ⟨ـتـ⟩ /t/, ⟨ـثـ⟩ /θ/, ⟨ـنـ⟩ /n/, and ⟨ـيـ⟩ /j/. Typically i‘jām are not considered diacritics but part of the letter. Early manuscripts of the Qur’ān did not use diacritics either for vowels or to distinguish the different values of the rasm. Vowel pointing was introduced first, as a red dot placed above, below, or beside the rasm, and later consonant pointing was introduced, as thin, short black single or multiple dashes placed above or below the rasm (image). These i‘jām became black dots about the same time as the ḥarakāt became small black letters or strokes. Typically, Egyptians do not use dots under final yā’ ⟨ي⟩, which looks exactly like alif maqṣūrah ⟨ى⟩ in handwriting and in print. This practice is also used in copies of the muṣḥaf (Qurʾān) scribed by ‘Uthman Ṭāhā. The same unification of yā and alif maqṣūrā has happened in Persian, resulting in what the Unicode Standard calls "arabic letter farsi yeh", that looks exactly the same as yā in initial and medial forms, but exactly the same as alif maqṣūrah in final and isolated forms ⟨یـ ـیـ ـی⟩. At the time when the i‘jām was optional, letters deliberately lacking the points of i‘jām: ⟨ح⟩ /ħ/, ⟨د⟩ /d/, ⟨ر⟩ /r/, ⟨س⟩ /s/, ⟨ص⟩ /sˤ/, ⟨ط⟩ /tˤ/, ⟨ع⟩ /ʕ/, ⟨ل⟩ /l/, ⟨ه⟩ /h/ — could be marked with a small v-shaped sign above or below the letter, or a semicircle, or a miniature of the letter itself (e.g. a small س to indicate that the letter in question is س and not ش), or one or several subscript dots, or a superscript hamza, or a superscript stroke. These signs, collectively known as ‘alāmātu-l-ihmāl, are still occasionally used in modern Arabic calligraphy, either for their original purpose (i.e. marking letters without i‘jām), or often as purely decorative space-fillers. The small ک above the kāf in its final and isolated forms ⟨ك ـك⟩ was originally ‘alāmatu-l-ihmāl, but became a permanent part of the letter. Previously this sign could also appear above the medial form of kāf, instead of the stroke on its ascender. Although often a diacritic is not considered a letter of the alphabet, the hamza هَمْزَة (hamzah, glottal stop), often stands as a separate letter in writing, is written in unpointed texts and is not considered a tashkīl. It may appear as a letter by itself or as a diacritic over or under an alif, wāw, or yā. If the glottal stop occurs at the beginning of the word, it is always indicated by hamza on an alif: above if the following vowel is /a/ or /u/ and below if it is /i/. If /i/ is before or after the glottal stop, a yāʼ with a hamzah is used (the two dots which are usually beneath the yāʾ disappear in this case): ⟨ئ⟩. Otherwise, if /u/ is before or after the glottal stop, a wāw with a hamzah is used: ⟨ؤ⟩. If the glottal stop occurs at the end of the word (ignoring any grammatical suffixes), if it follows a short vowel it is written above alif, wāw, or yā the same as for a medial case; otherwise on the line (i.e. if it follows a long vowel, diphthong or consonant). Two alifs in succession are never allowed: /ʔaː/ is written with alif maddah ⟨آ⟩ and /aːʔ/ is written with a free hamzah on the line ⟨اء⟩. Consider the following words: ⟨أَخ⟩ /ʔax/ ("brother"), ⟨إِسماعيل⟩ /ʔismaːʕiːl/ ("Ismael"), ⟨أُمّ⟩ /ʔumm/ ("mother"). All three of above words "begin" with a vowel opening the syllable, and in each case, alif is used to designate the initial glottal stop (the actual beginning). But if we consider middle syllables "beginning" with a vowel: ⟨نَشْأَة⟩ /naʃʔa/ ("origin"), ⟨أْفِئدة⟩ /ʔafʔida/ ("hearts" — notice the /ʔi/ syllable; singular ⟨فُؤَاد⟩ /fuʔaːd/), ⟨رُؤُوس⟩ /ruʔuːs/ ("heads", singular ⟨رَأْس⟩ /raʔs/), the situation is different, as noted above. See the comprehensive article on hamzah for more details. Evolution of early Arabic calligraphy (9th–11th century). The Basmala was taken as an example, from kufic Qur’ān manuscripts. 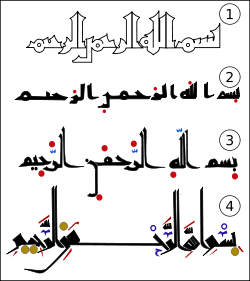 (4) 11th century, in al-Farāhídi's system (system we know today) dots were changed into shapes resembling the letters to transcribe the corresponding long vowels (see image of modern Kufic in Qur'an). According to tradition, the first to commission a system of harakat was Ali who appointed Abu al-Aswad al-Du'ali for the task. Abu al-Aswad devised a system of dots to signal the three short vowels (along with their respective allophones) of Arabic. This system of dots predates the i‘jām, dots used to distinguish between different consonants. Abu al-Aswad's system of Harakat was different from the system we know today. The system used red dots with each arrangement or position indicating a different short vowel. A dot above a letter indicated the vowel a, a dot below indicated the vowel i, a dot on the side of a letter stood for the vowel u, and two dots stood for the tanwīn. However, the early manuscripts of the Qur'an did not use the vowel signs for every letter requiring them, but only for letters where they were necessary for a correct reading. This is the precursor to the system we know today. al-Farāhīdī found that the task of writing using two different colours was tedious and impractical. Another complication was that the i‘jām had been introduced by then, which, while they were short strokes rather than the round dots seen today, meant that without a color distinction the two could become confused. Accordingly, he replaced the ḥarakāt with small superscript letters: small alif, yā’, and wāw for the short vowels corresponding to the long vowels written with those letters, a small s(h)īn for shaddah (geminate), a small khā’ for khafīf (short consonant; no longer used). His system is essentially the one we know today. ^ a b "Introduction to Written Arabic". University of Victoria, Canada. ^ "Arabic character notes". r12a. ^ Gacek, Adam (2009). "Unpointed letters". Arabic Manuscripts: A Vademecum for Readers. BRILL. p. 286. ISBN 90-04-17036-7. ^ Gacek, Adam (1989). "Technical Practices and Recommendations Recorded by Classical and Post-Classical Arabic Scholars Concerning the Copying and Correction of Manuscripts" (PDF). In François Déroche (ed.). Les manuscrits du Moyen-Orient: essais de codicologie et de paléographie. Actes du colloque d'Istanbul (Istanbul 26–29 mai 1986). p. 57 (§8. Diacritical marks and vowelisation). ^ Versteegh, C. H. M. (1997). The Arabic Language. Columbia University Press. pp. 56ff. ISBN 978-0-231-11152-2.